Christmas and gift-giving/receiving are cool, but shopping is kind of annoying. Especially at the big stores. I really don’t like those monster-sized displays that are all glittery and say some clever slogan about the holidays. I also hate how around this time of year companies just make up weird stuff that people don’t really need. Has anyone ever really mastered those crazy yo-yo things they sell in the mall? And who has ever wanted to pay for bubblegum out of a machine in their own home? Living in Lawrence allows me to isolate myself from this, which I like quite a bit. I shop downtown on my way to/from working at coffee shops usually. I only go into the stores I like, shopping little by little until I have everything. This is fun because I get to go to the places I like, and I have a legitimate excuse to buy stuff. For example, every year (for almost all occasions), my sister Alyssa (who just got back from London-hooray!) gets something from Wonderfair. I’m not worried about writing this here and her seeing it, because it’s a pattern I’m sure she’s already picked up on. My friends and I don’t buy each other things very often because we are graduate students and don’t have any money. Or we do something together and let that count as a Christmas present–for example, best friend Molly and I have pretty much got the next few birthdays/Christmases taken care of with all the concert trips we’ve taken. If someone does buy you a gift, you have to buy them a gift, etc, etc, and this huge chain starts that can get hard to keep up with. However, this year my friend Rachel (of Smachos fame) said she was going to make me a gift. Everybody’s getting all crafty here in Lawrence, KS. So, I decided I’d make people something, too. I wanted to do something garden-related but realized that if I gave people something from the garden in December, it would likely be very dead tomato plants or dirt. I have few friends who would be happy to receive dirt. What I decided on involved buying Mason Jars, so I was sold. I made some friends chocolate peanut butter. It’s essentially the easiest thing ever: roast peanuts, chop/blend them, and mix with melted chocolate. 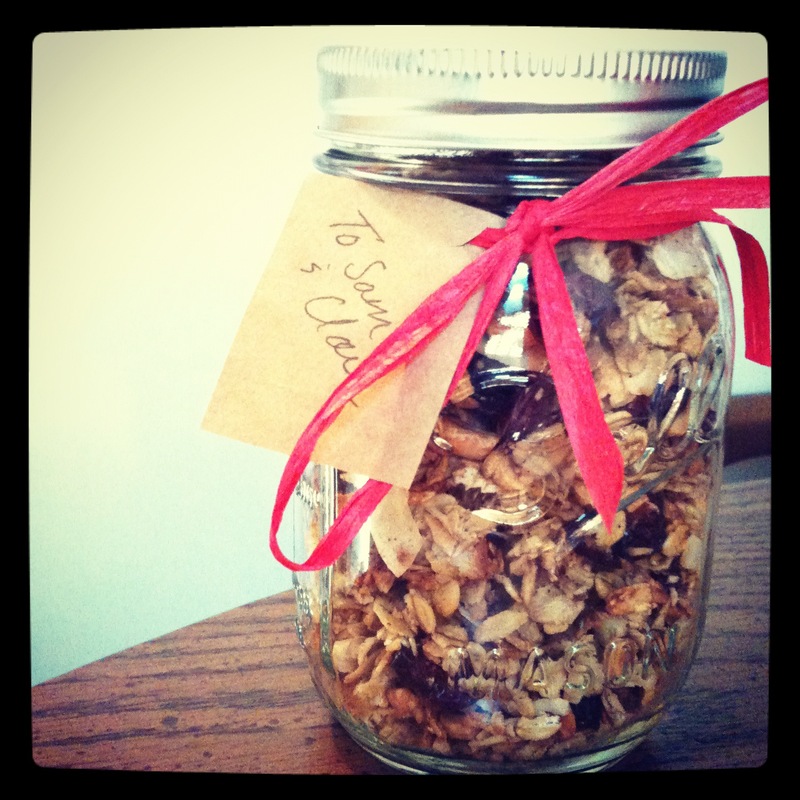 Other friends got homemade granola. Though I tried a few different formulas, I found this combination to be practically perfect: oats + molasses + oil + unsweetened coconut + craisins + apples + cinnamon. I think molasses might be my new favorite thing. And what homemade gift did I receive from Rachel?, you ask. It’s real cool. And totally blog related (which is mostly why I’m writing this. I’m also writing this because I did something uncharacteristic recently and got an iPhone, so now I can take super hip photos. 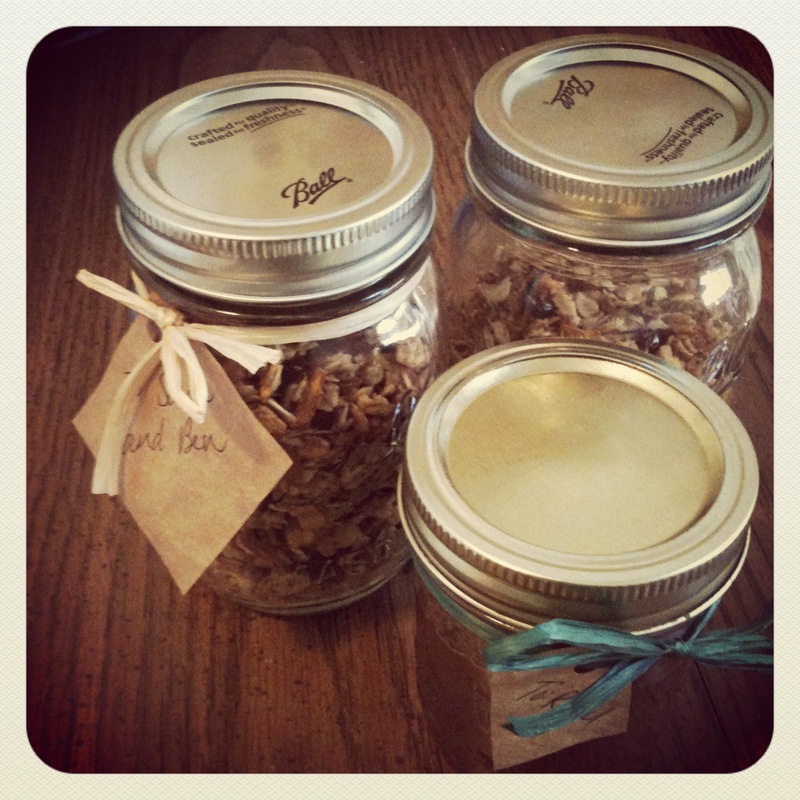 I kinda just want to show off how awesome those Mason jars look). 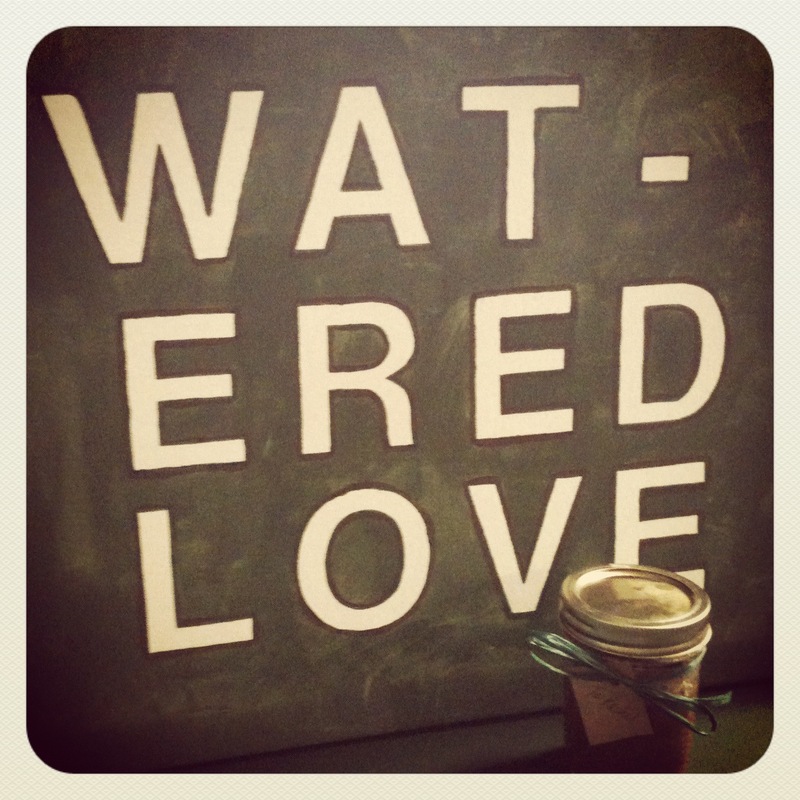 She painted the canvas in the photo to say “Watered Love.” I just think it’s great. And the colors are my favorite–brown and green. Our presents matched each other, which was also just great. I’m still choosing the perfect spot in my apartment. Disclaimer: if you are my friend and you didn’t get chocolate pb or granola, it does not mean I don’t love you. It just means that we haven’t seen each other or that I didn’t think you’d care about granola. I’m almost certain I still love you. The title sounds quite bold. If you’re expecting me to predict what writing will be like in the future, think again. If you’re hoping to read more about sweet potatoes, again, think again. I’m mostly writing this entry to share an accomplishment with you. If you don’t know, in May I hope to/will graduate from KU with my Master’s in Rhetoric and Composition. My three years in Lawrence are coming to a close. At this point, I could probably get some kind of job. Doing what, you ask? Well, mostly anything. Or nothing. I think that’s what an English degree + a Master’s in English is good for these days. When I found this job, I could start making a larger salary and get furniture from a store instead of from family or family friends. I could also buy matching plates and make friends who went to happy hour. I could probably get a dog, too, and we’d go on walks and stuff. But I don’t know about all that just yet. You’ll remember that in the last six months or so, I’ve had a bit of success getting published and getting to read around Lawrence. I’ve decided that I really like doing this. And that I want to keep doing this…at least for awhile. See those papers with crazy marks and notes everywhere? Doesn’t that look like fun? So, I’ve decided to apply to MFA programs and Creative PhD programs. I mailed the last one off last week. I’m looking for two things: 1) being accepted somewhere 2) getting funding somewhere because one should not pay for graduate school. To the skeptics: I know that no one grows up to be a writer and only a writer. Well, a few people do. I know I will have to teach or get a job doing something else and then write on the side. 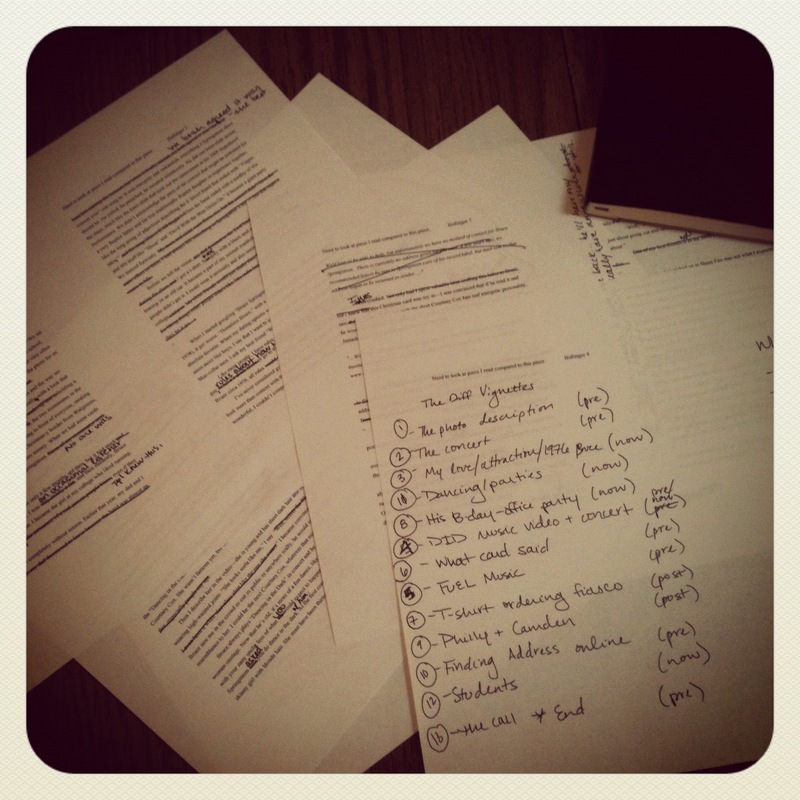 Mostly, I just want to spend some time becoming a better writer. And I am young and hip and have no real responsibilities besides grad school (which we’ve already established I will have finished by this point). 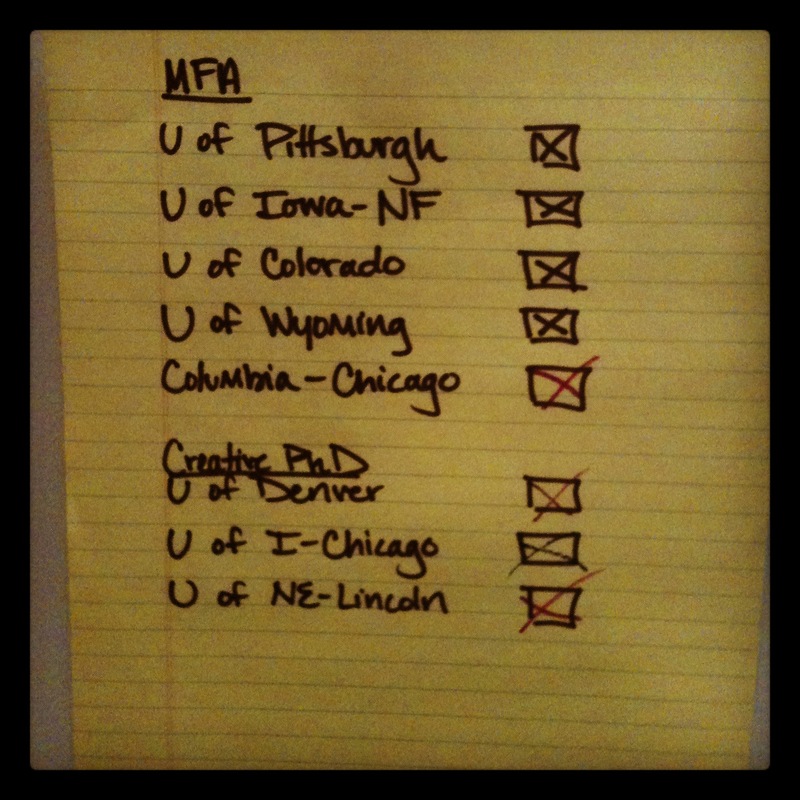 In the photo, you’ll see my list (written in very official, grown up Sharpie) of where I might be next year. Or where I want to be but might not get to go. I realize that by telling you all that I applied to schools, there’s a potential for embarrassment if I don’t get it. Let’s just say…if I don’t mention it, it probably means I got rejected. Also, I just have to point this out: Schools are really smart about advertising. I know that all companies/organizations choose attractive, happy people for their advertisements. Duh. I do, after all, live in consumerist America; I’ve seen this before. However, I feel like one school in Chicago directly targeted me. After I’d already applied there, I received an ad with this gent on the front. Technically I’d already applied there, so this ad didn’t really affect my decision, but I think it would be hard to throw away. Seriously, Mr. Elbow Patches and Glasses? Will I move to Chicago? Yes. Though I tried, I couldn’t bring myself to put him in the recycling bin. 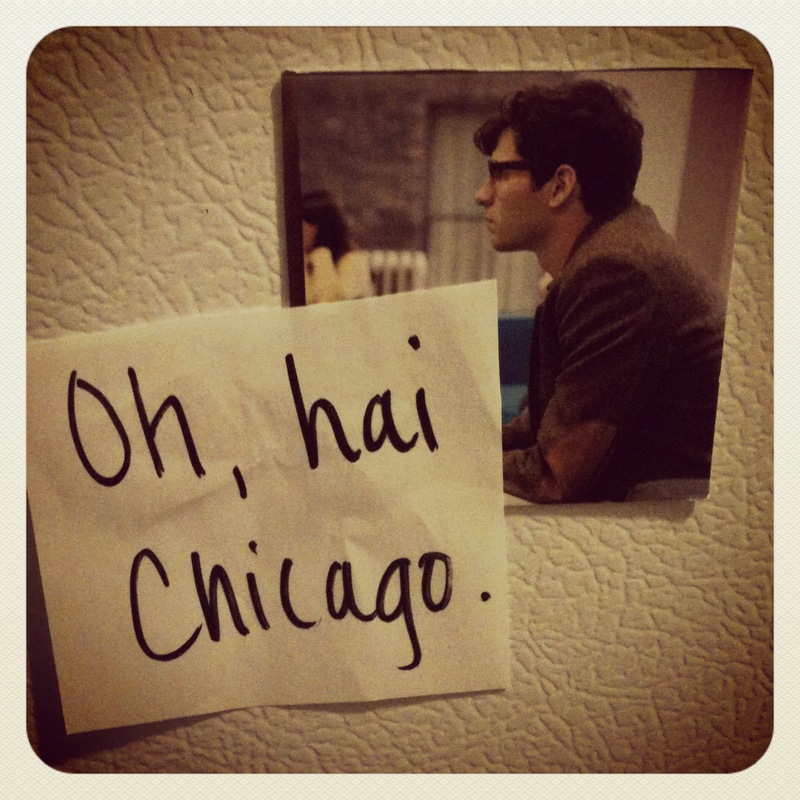 He’s on my fridge as my new motivation for staying positive about next year. Now if only they had a photo of this guy in a community garden; my decision would be made. 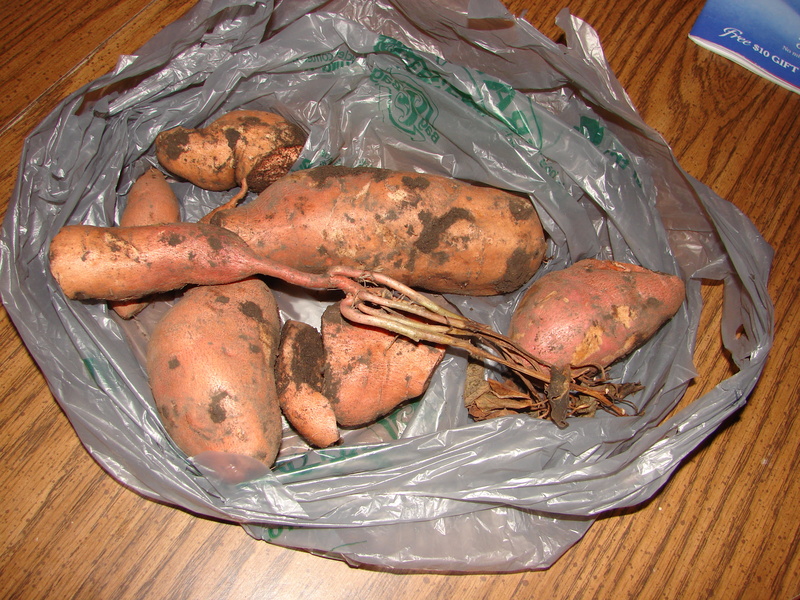 Sweet Potatoes: What the coolest kids are doing on Friday nights. I am happily pulling myself out of the cave I’ve entered to survive the end of the Fall 2011 semester so that I can write you fine people this quick little blog post. I think that “cave time” happens at the end of the semester because we (grad students) go into survival mode. We still hang out, but we’re normally doing work together; fun typically happens only on the weekends and even then, it’s sometimes sparse. Or we feel guilty for it (the worst!) For me, I just get really tired, and as much as I love my friends and downtown Lawrence in the evenings, I also love my couch and the tea or whiskey in the kitchen cabinet. Sometimes even deciding what to wear when exiting the cave can be really tiring. Sweater? Sweatshirt? Jeans? Skirt? Keds? Boots? To avoid having to think about this, I’ve been wearing pretty much the same basic outfit for a few weeks: cardigan + jeans + boots. A fail-proof formula. On Monday I talked myself into a dress, and that was fun. And all of that, leads to the garden, I promise. Oddly enough, Fridays are one of my longest days of the week (don’t even get me started on Wednesdays). So, even though the “normal” 24-year-old would always want to go out on a Friday night, a few times a month, by the time I get through Friday, I just want to be at home and cook a good dinner and watch a movie and sleep. I am a Grandma in a 24-year-old’s body. A few Fridays ago, my big event for the night was digging sweet potatoes. It had already frosted and I wanted to get them out. So, that’s what I did immediately after getting home. While the Vineyard Vines-clad Fratty McFrattersons bought kegs at Cork and Barrel preparing for a big weekend, I dug sweet potatoes. Yep, that’s me. 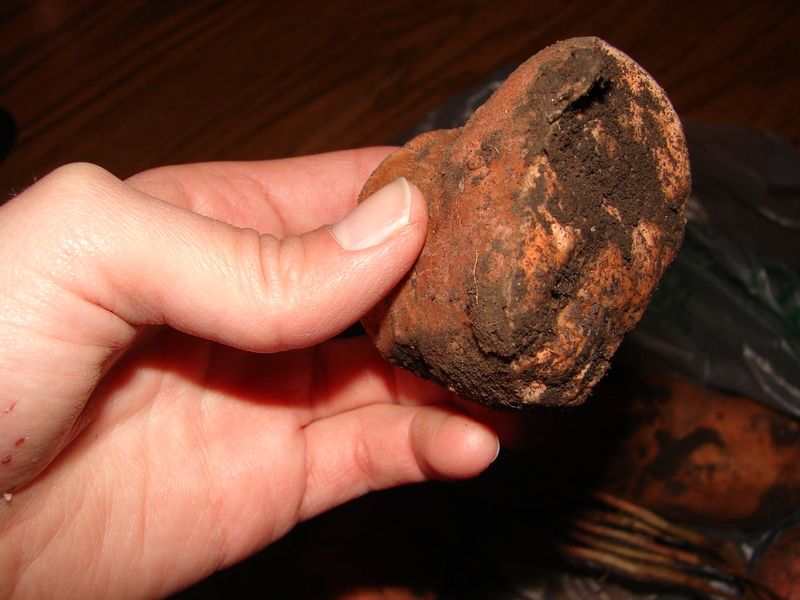 Digging potatoes is quite fun, but the thing about them is that you don’t really know where they are. Or at least I didn’t. I just started shoving the shovel (can I say that?) into the general area they were in, hoping to find something. And I did! With my “point and shove” method, I ended up cutting quite a few of the potatoes in half. I think that some of the other halves are still in the ground somewhere. They got lost, and by “lost,” I mean that in my frantic attempts to get them out of the ground, I buried them in dirt. I’d estimate that I got 93% of the potatoes in the ground. That’s mostly efficient. I was home by 6:30. A successful Friday night. For no more than Amelia and I planted, I was happy with what we harvested. Since she’s in Omaha now (next summer might be lonely in the old garden plot), I’ve saved her some. My share is long gone. 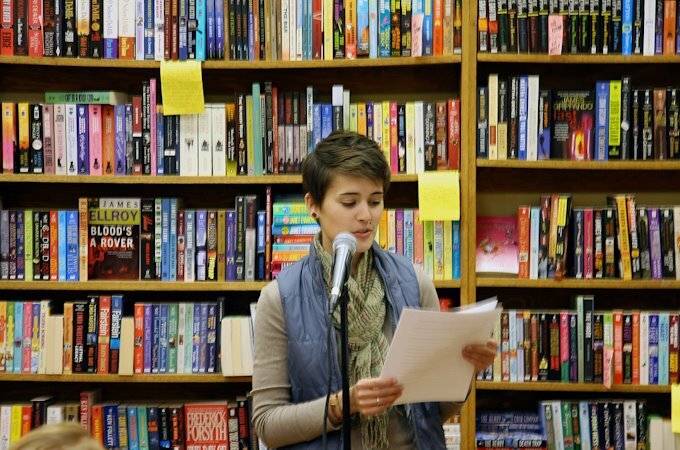 In news totally unrelated to sweet potatoes, but related to food, I did get out a few weeks ago for a reading. It was for a fundraiser for Beecher’s Magazine (the lit magazine I mentioned last post). There were lots of great readers and we were quite successful and though the theme was “Food,” I didn’t even read about the garden. Ah, surprises.